Short Decsription of Holy Trinity, Hethe. Roman Catholic church, 1832. The church is in a Gothic style. MATERIALS: squared coursed limestone, with a slated roof. PLAN: the building is rectangular on plan, on a roughly north/south axis, being entered from the south, with the altar to the north. The following description follows conventional liturgical orientation. The church is linked to the presbytery by a single-storey sacristy, at the north-west (liturgical south-west) corner of the church. EXTERIOR: the church is of four bays, marked by offset buttresses; there are angle buttresses to the western and south-east corners. The west and east ends are gabled. The entrance is set within a broad projection, representing the vestibule. The central pointed-arched doorway with hoodmould and headstops contains the original plank and rail door. Above is a large four-light window with intersecting tracery; set back to either side is a tall single lancet. There is a stone cross to the central gables; the crocketed finials to the west end are replica replacements of 1997. To the sides, each bay has a two-light pointed window with Y-tracery, each having a hoodmould with headstops. INTERIOR: the nave and sanctuary are combined, with the shallow vestibule to the west, above which is a gallery. The ceiling of the sanctuary is demarcated with a painted border, with a painted representation of the Trinity at the centre. The sanctuary to the east is painted with a rich scheme of stencil decoration, dating from 1932, with symbols of the evangelists in roundels above, and below, armorial bearings, relating to the Fermor family, all linked by vines. The altar, which has been attributed on stylistic grounds to A W Pugin (O’Donnell, R, The Pugins and the Catholic Midlands, 2002) is decorated with blind quatrefoil panels with a central open brass tabernacle throne; below the mensa are recessed trefoil niches. Above the altar is a C18 mirror copy of Jean Jouvenet’s Descent from the Cross. To the south of the altar is a stone trefoil-headed piscina. To either side of the altar, stone canopied niches hold carved angels; these were moved from the nave walls, probably in 1932. In the corners of the sanctuary stand polychrome statues of the Virgin Mary and the Sacred Heart on Gothic pedestals, installed in 1932. The sanctuary is enclosed by original Gothic altar rails, with iron intersecting tracery and a mahogany rail, and brass doors. To the south is a timber pulpit with blind trefoil-headed panels, possibly of 1932. The paired lancet windows of the nave contain stained glass, mainly commemorating the local Collingridge family, dating from the mid-C19 to 1870; the five nearest the sanctuary are by Francis Barnett of the Edinburgh and Leith Glass Works, a relation by marriage. In the nave, the narrow oak pews, with ovals and quatrefoils cut into the sides, are thought to be mid- to late-C19. In the south-west corner of the church is an early-C19 chamber organ, originally in domestic use, acquired in 1986. In the south-east corner is the stone octagonal font with an oak cover, its sides carved with quatrefoils; this has also been attributed to Pugin, being similar to that at St John, Banbury where Pugin worked. The gallery has blind Gothic ogival arcading to the front; below are basket-arched doors with Gothic panels below and glazing above. 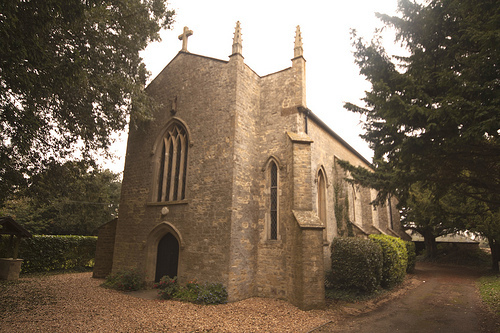 SUBSIDIARY FEATURES: at the north-west (liturgical south-west) the church is linked to the presbytery by a single-storey Gothic sacristy, with paired pointed windows below a hoodmould. This has been extended to the north in the late-C20, the style of the extension being consistent with the church as to style and materials; this part of the building is of lesser interest.